BlackBerry Ltd said on Monday that Andrew Bocking, the executive in charge of its BBM instant messaging business, has left the company. The Waterloo, Ontario-based company did not disclose whether Bocking's departure was part of an internal management shuffle or whether he left to pursue other interests. The technology company, which is seeking to rebuild itself under the leadership of new Chief Executive John Chen, said only that Bocking "made the decision to leave BlackBerry". Since taking the reins late last year, Chen has reshuffled management ranks and has signaled that he plans to focus more on the company's services, or enterprise, business, which manages smartphone traffic on the internal networks of corporate and government clients. 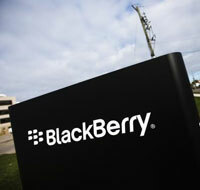 BlackBerry said John Sims, who heads the company's enterprise segment, will add the BBM team to his organization. The company said it plans to build on BBM's strength in messaging and expand it into new areas, including mobile marketing, community building and enterprise messaging. News of Bocking's departure was reported initially by tech news website BGR earlier on Monday.